Policy of publication. Aims & Scope. This is an academic journal. The editorial board does not accept materials previously published in other sources. If the author sent requests for publishing to several sources simultaneously, he or she must notify our editorial board. Authors involved in plagiarism will be blacklisted and will be denied services in the future. Do not use academic articles for publicity or self-promotion; do not cite newspapers or non-academic journals, or quote statements made on television. We encourage citations from academic sources on the Internet. The editorial board does not accept text resembling course papers. Authors must demonstrate not only good knowledge of the subject matter and works by other scholars who studied it previously, but also demonstrate new academic approach in their publications. Selected fragments from dissertations, books and monographs are not accepted, since the writing style of such materials does not correspond to the style of this journal. It is not encouraged when a researcher, interpreting various academic terms in an article, begins an absentee debate with authors of textbooks, tutorial manuals or dictionaries, which cannot substantiate their academic position in fragmented portions and end up in an unfavorable position from the start. For the sake of scholarly polemics, it would be much better if you would refer to the texts of your opponents’ monographs or dissertations. 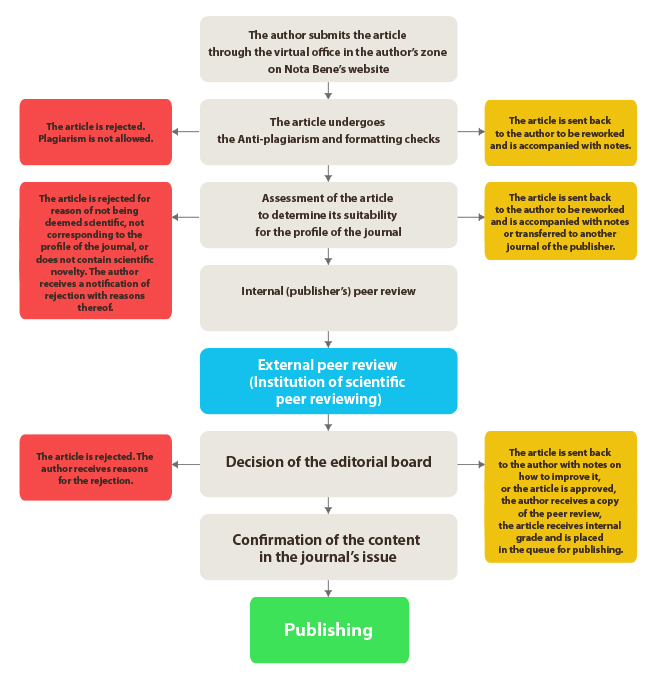 The scope of this journal and the structure of the rubrics define the most appropriate size of the articles accepted for publication. On the average, it must consist of 20-40 thousand characters. The page references and footnotes are prohibited. If you use a footnote that does not contain a reference to the source, such as an explanation of the term, please, include it in the text. Some larger articles may also be accepted subject to the approval of the editor-in-chief. The articles must be submitted through the Internet at the website of the publication: http://en.e-notabene.ru/ (click on "Author area"). After completing the registration process, it is necessary to add an annotation in Russian, no less than 170 words long, followed by 10 keywords, and then the article itself with the bibliography (references) at the end. There should be as many sources as possible. It is necessary to print out and to sign two copies of the contract, and then send scanned copies of them to the address of the edition (only the first and last pages) or by regular mail to the following address. Complementary copies are sent out only to authors living in other cities. Authors living in Moscow can pick up their copies of the journals at the publishing house. When submitting a technical issue, please provide as much details as possible, what you are trying to do, and what it is that you are having trouble with, what mistakes are occurring. If you are able, please make screenshots of the pages with errors. The more details you provide, the faster we will be able to solve the issue. For more information regarding publication of texts, please see the «Frequently asked questions» section. This section also has contact information of the editors of the journals.